Since 2007 we have been monitoring wild populations of Military macaw (Ara militaris) in the Banderas Bay region. We have located 4 populations. Actually, 28 nests has been located in our study area, 3 near the Sierra Paraiso site, 3 in land belonging to Las Juntas y Los Veranos and 22 nests in Boca de Tomatlán. Although only up to about 19 active nests have been observed at the same time in one season. With the help of 3 local guides, the systematic monitoring of the productivity and protection of the nests of the Boca de Tomatlán and Sierra Paraíso has begun. Recent advances of our monitoring can be consulted in News tab in the menu, in Scientific research and Community Outreach. 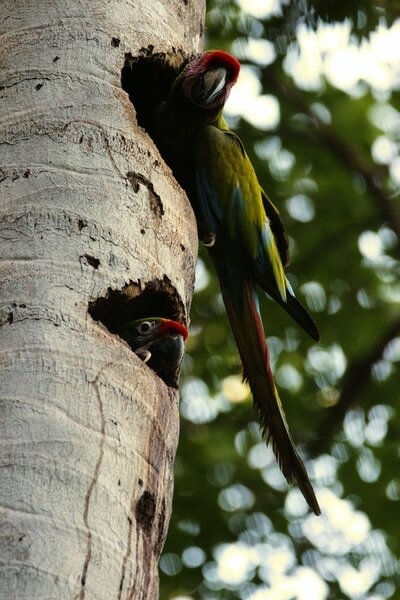 In the season 2009 – 2010 we achieved the location of 10 military macaw nests. According to other studies this corresponds to the total nests of a population of 100 individuals. The results of monitoring this season was 8 successful nests, one depredated nest by a gray falcon (Buteo nitidus) and one stolen nest by someone from las Juntas y los Veranos. The loss of the nest by human depredation went down this year about 70%, from last year in the season 2008-2009. Some posters were hung telling people about the legal risks of stealing or selling wild animals and plants. These were spread all around the communities of Palmita del Cacao, Boca de Tomatlán, Yelapa, Las Juntas y los Veranos , El Tuito, Bioto y Soyatan.